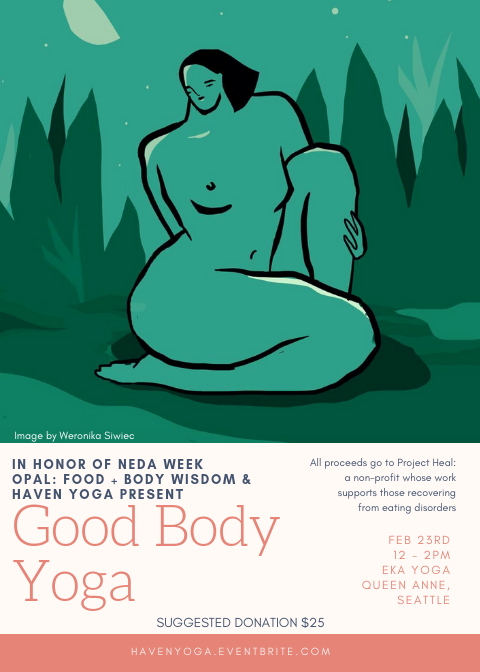 Opal: Food + Body Wisdom and Jenny Wade of Haven Yoga are joining forces for a NEDA week (National Eating Disorders) body love yoga class. Jenny will lead soulful yoga focusing on radical self-care and body love. Body love is a message that is spoken of more and more in our culture, but when we grow up hating and mistrusting our bodies, it can be difficult to know how to shift our relationship. In this nourishing class you will learn how to take practical and effective steps to cultivate body acceptance. Your body is not an object. It is not an image. It is your home. All proceeds will go towards Project Heal, a non-profit organization that supports those who cannot afford eating disorder treatment. Suggested donation of $25, but don’t let finances stop you from attending. Pay what you can, and allow yourself to receive the care of paying attention to your body. ALL bodies and levels of experience are welcomed!